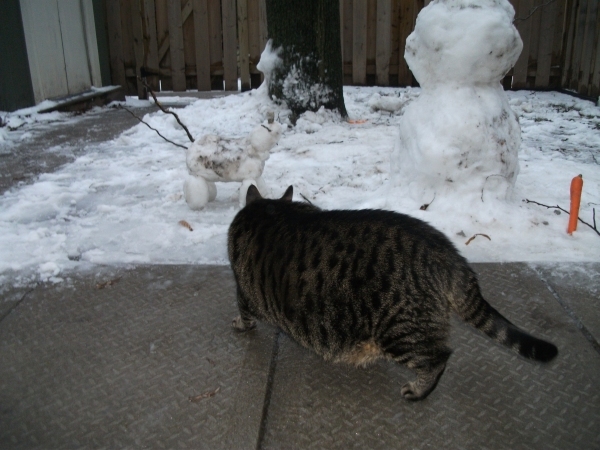 January 1, 2013 10:02 P.M. Happy New Year! 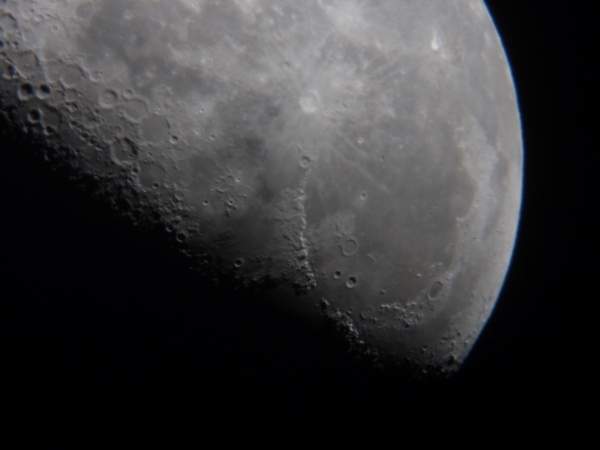 Nice night for viewing, although things look best through the low power lens. They usually do. Jupiter looked good, and its moon Io was just ending a transit. At first glance, the pic below might seem to show Jupiter's four "Galilean" moons and a star, but if you look carefully, you'll see the bottom point is slightly reddish. Thats because it's a star; HIP 20417 A, at 1753 light-years away with a mag level of 6.00. Above that is Jupiter's moons, Callisto, then Europa. If you look carefully at the bottom of Jupiter, you'll see a little round dot; that's Io. 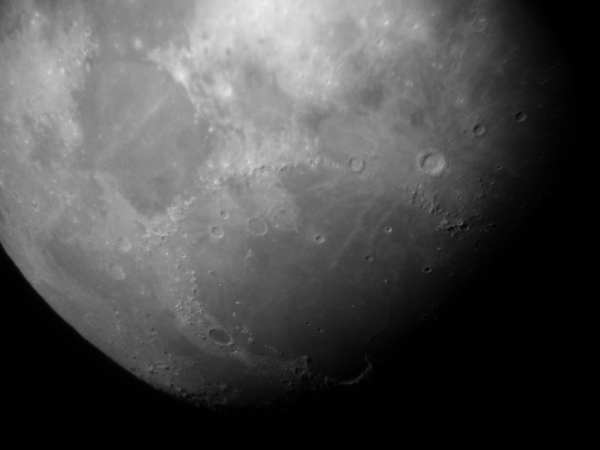 Then above Jupiter, that's the moon Ganymede. The point of light to the right is another star, HIP 20493, which is another mag level 6.00 object, but this star is only 482 light years distant. Just goes to show, things aren't always as they appear at first glance. Well, this January certainly isn't turning out like the January last year. Very humid at nights (over 80%), and usually cloudy. 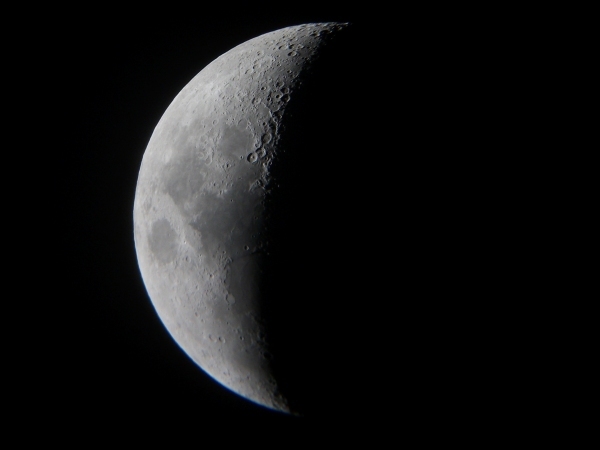 February 4, 2013 10:51:55 - 10:52:00 P.M.
Great night for viewing, wow. I only decided to take some pictures after being out for an hour. Orion and the Pleiades looked great, as did Jupiter. 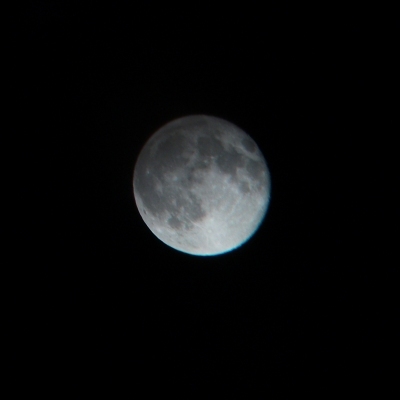 Finally could see things through the high power lens. 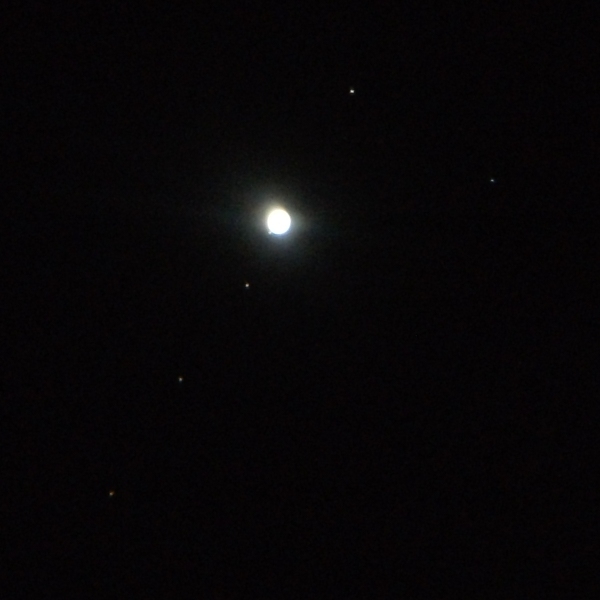 The following five shots show Jupiter taken a second apart from each other; floats by pretty quick through a 25X lens. I cropped them on the top and bottom, but the length is as they came off the camera. The sixth shot is one of the images at half size from original. 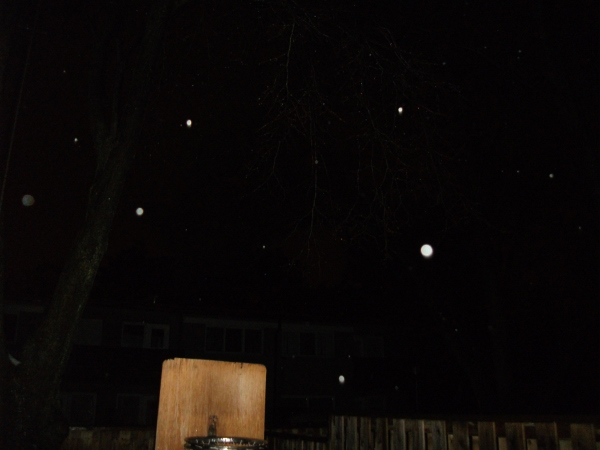 March 14, 2013 8:38 P.M.
"The Winter of Humidity", that's what this is. 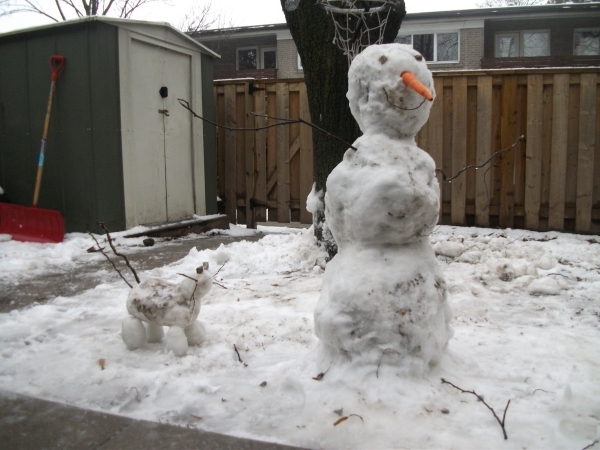 Lots of snow, then warm temps. Then cold, more snow, and more warmth. Can't win! I still try, though. Some nights the humidity is almost interesting. 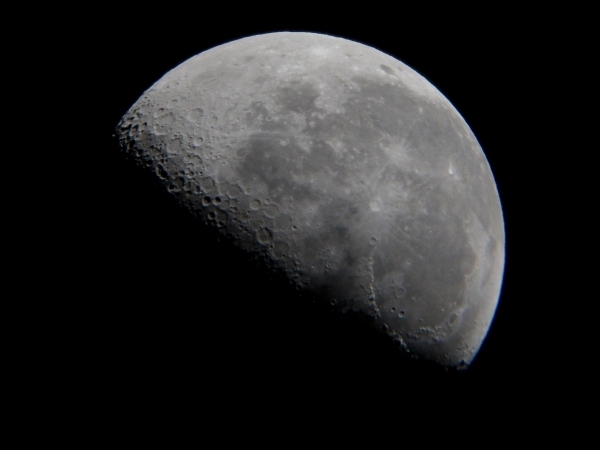 As the shot below shows, sometimes all that moisture lets you see (and photograph) things you normally couldn't, such as the unlit part of the moon. March 17, 2013 7:55 - 7:56 P.M. 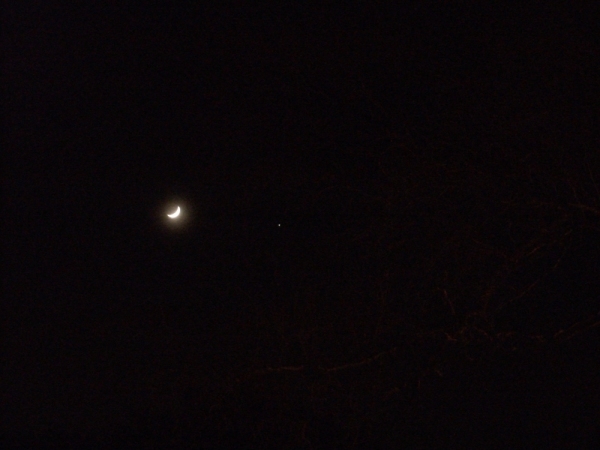 Here's a couple of shots of the Moon and Jupiter together. The first shot is the view at 1:1, and the second is on 4X zoom. 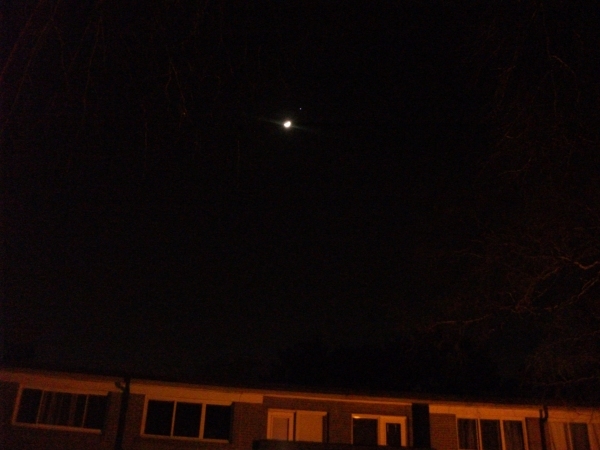 The second shot shows another point of light besides Jupiter; that would be the star Alpha Tauri. It's 65 light years away. Click on the first picture for a larger image. March 17, 2013 8:00 - 8:01 P.M. 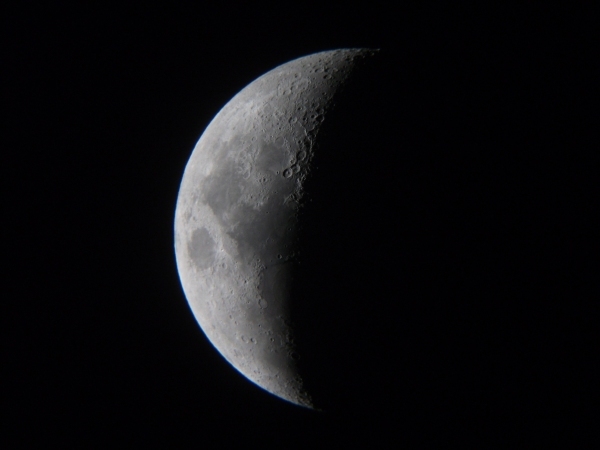 Here's a couple more shots of the Moon. The first shot is the view at 1:1, and the second is on 4X zoom, just like the above. 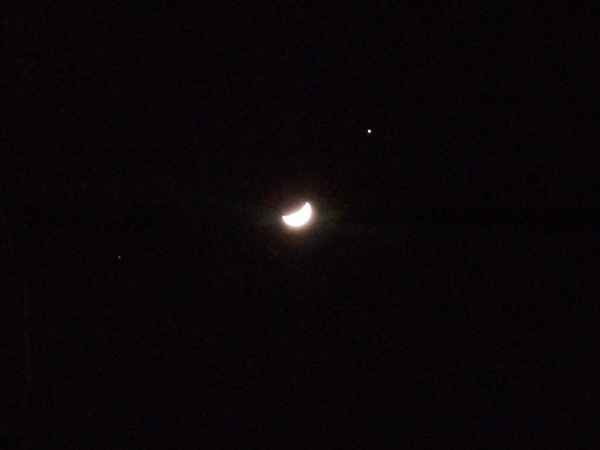 March 23, 2013 9:45 & 9:46 P.M. 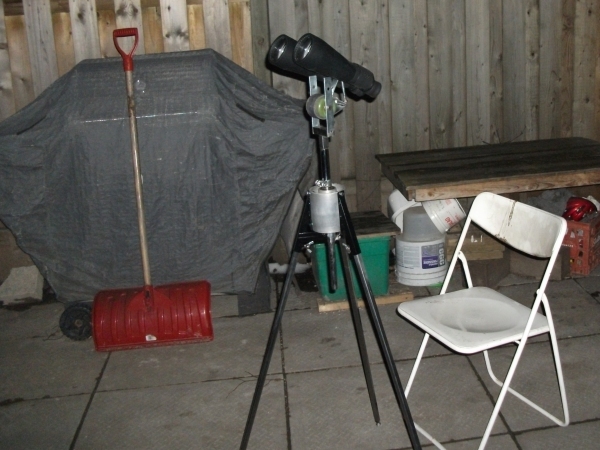 I received a belated X-mas present last week; a set of Celestron 15 X 70 binoculars. Wow, these things are amazing. 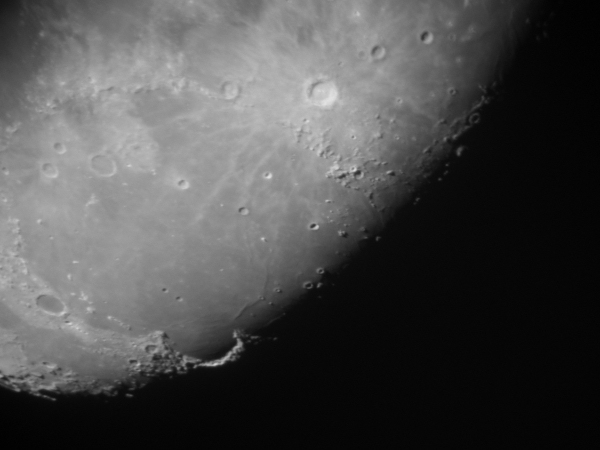 Such a wide field of view, you can see Jupiter's moons and the craters on our moon. As for the Orion nebula, the 3 stars that make up Orion's belt fit perfectly in the field of view. Betelgeuse looks even redder through them (I so hope this star goes nova in my lifetime...!). They are fairly easy to hold, but I thought they'd benefit from a tripod. Being kinda broke, I made one from an old belt sander, some square tubing, two skateboard wheels, and various bits and pieces I had laying around. Cost me just under $7, and it works very well. 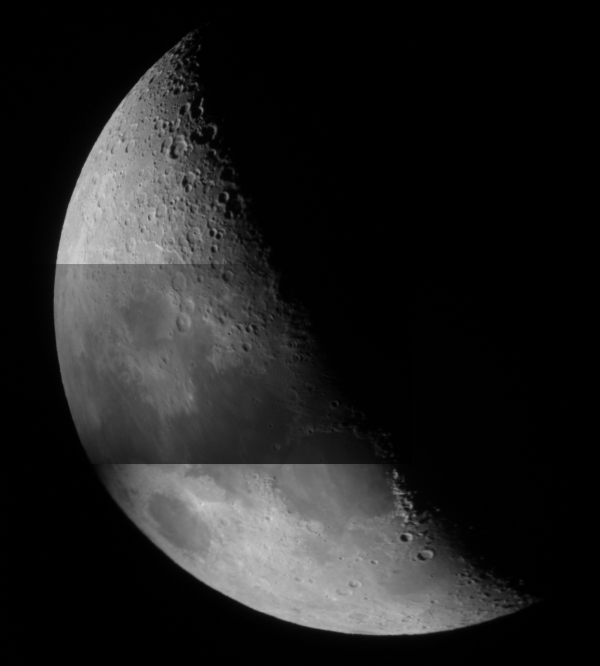 Great views of the moon; gotta love stereo vision! April 2, 2013 5:40 - 5:44 A.M.
Well, nothing like your bladder waking you up early. Even better when you can't get back to sleep. Took a look outside, still very humid but fairly clear and dark. So out I went with the scope and bino's. 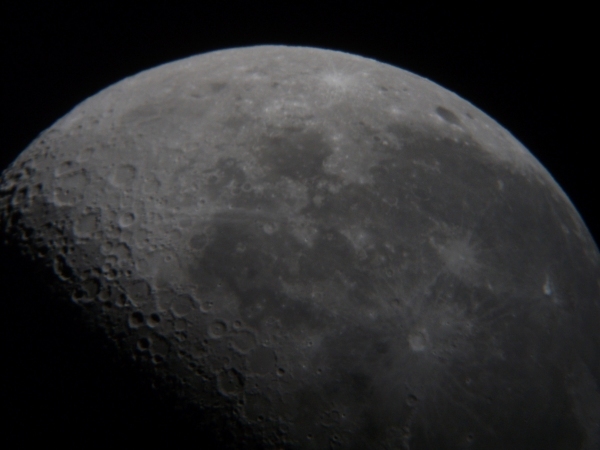 The first three are of the moon, obviously, the last two taken with the 10X lens. 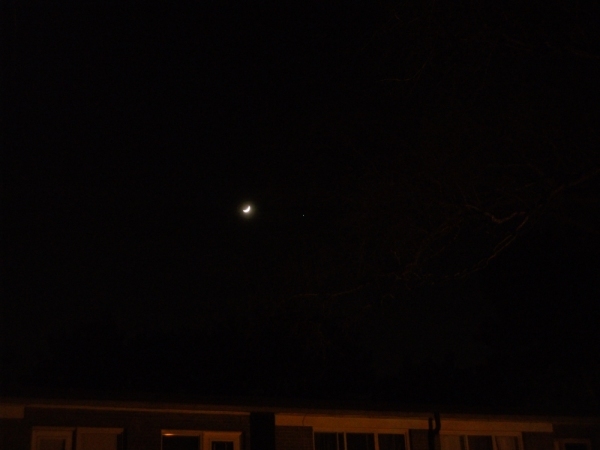 A couple of minutes later I tried to take a shot of the moon through the bino's; the fourth picture is the best I took. There must be a way...! 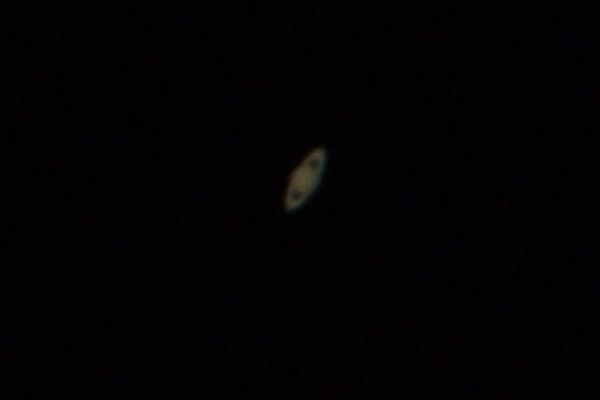 Then it was back to the telescope and a quick look for Saturn, came out O.K. The view for me was quite good, though. It started getting bright at 6:30, so I wrapped it up for the day. 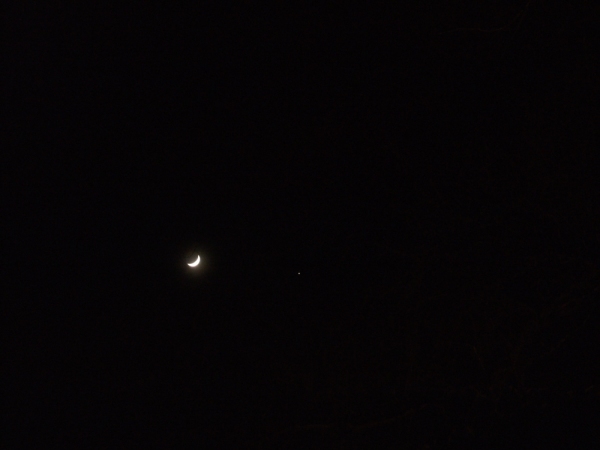 April 14, 2013 10:02 P.M.
Close conjunction of the moon and Jupiter again, but the weather lately hasn't been cooperating. I thought I'd miss this one, too (there's been a few this year; the only one I saw was in March, thanks to the weather...), but just before 10 o'clock there was a break in the clouds. A bit on the foggy side, but I think these pictures came out well. The first two are at ISO 400, and the third is at ISO 800. It looked great through the binoculars, even with the fog. May 1, 2013 5:30 P.M.
Nice day out, so I thought I'd try to get a view of the Sun through my binoculars. 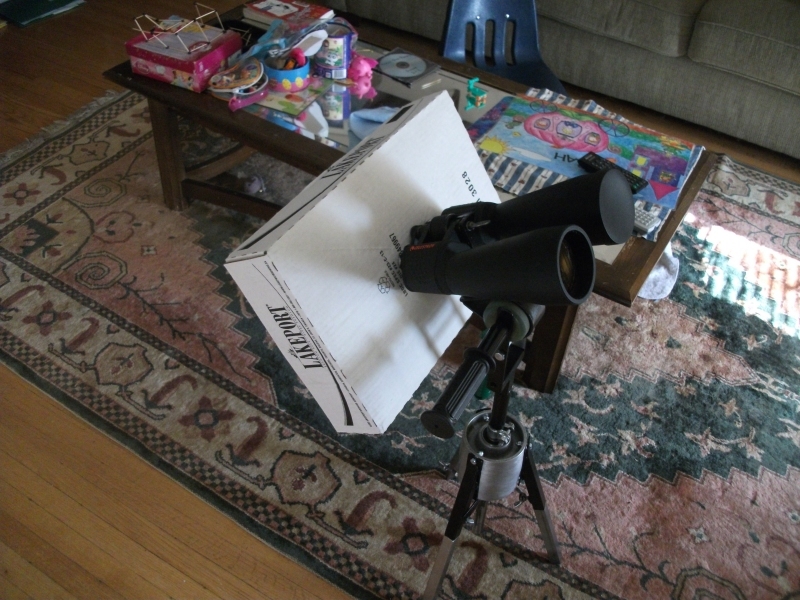 I made a short set of legs for my tripod, mounted the binoculars, and made a "shield" from some white cardboard. 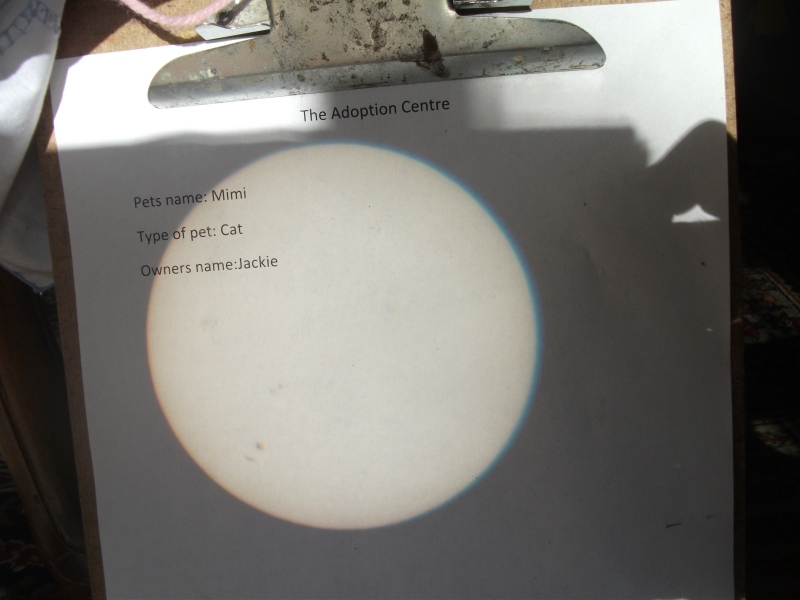 Then I took a piece of paper (one of my daughters "pet adoption" forms, lol..), put it on a clipboard and propped it against a table leg. There's four sunspots to the bottom left, you can see them better in the lower picture. Each one is bigger than our Earth. I thought this was pretty neat; I'll have to try this again. This is a picture of my set-up. Whatever works, eh? 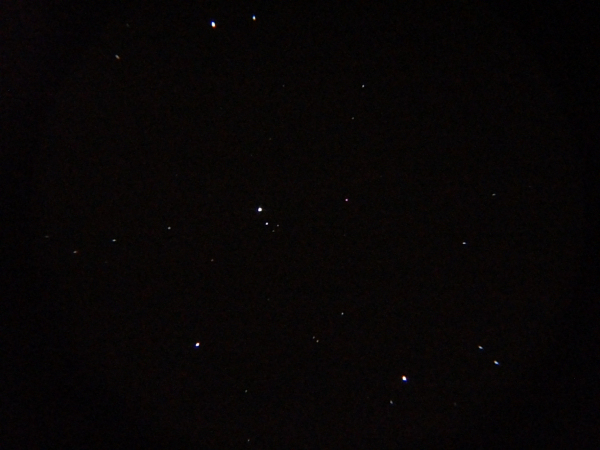 May 1, 2013 11:35 P.M.
Now it's a nice night out, and I was out with the telescope. Here's a couple of O.K. shots of Saturn. May 20, 2013 5:15 P.M. 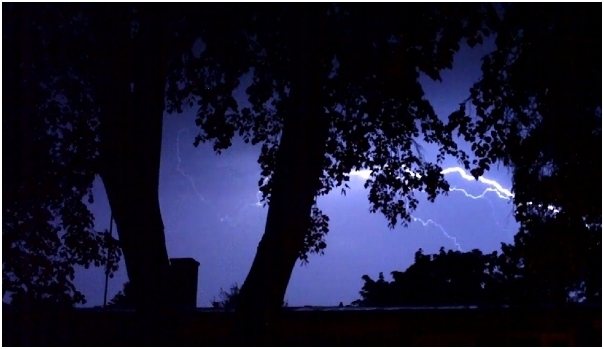 It's been very warm and humid lately, makes for some great late-day thunderstorms, even if it does make for either lousy or no night time viewing. You have to take what Mother Nature throws at you and make the best of it. 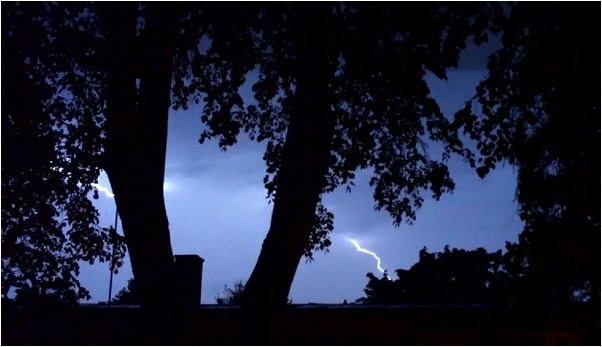 This thunderstorm was a good one, so I got the video camera and started filming. 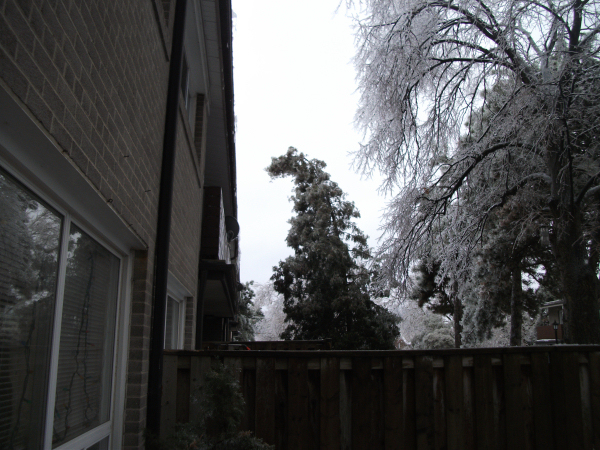 The view is out the back door; too bad the tree gets in the way somewhat. The camera films at 36 FPS, these are three frames, one after the other, for a total of a twelfth of a second. The accompanying thunder a few seconds later was quite loud, too! May 22, 2013 11:31 P.M. Somewhat cloudy night tonight, with three days until the full moon. I was hoping to even get a decent view through my binoculars; oh, well. However, I got this shot with just the camera; it's the moon clouded over, taken through a gap in the branches of our tree. Nice shot, I think. May 26, 2013 1:14 A.M. Pretty clear out tonight, great view through the bino's. Tried again with the camera, this is the best shot out of 16. 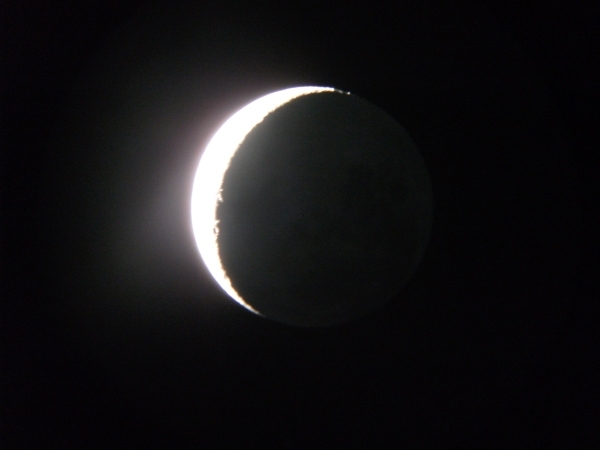 This is aout the size you'd see when looking at the Moon through them. 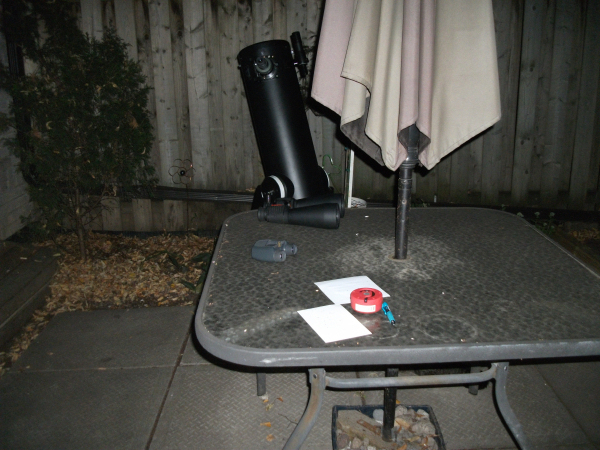 They're a set of Celestron 15X70's. 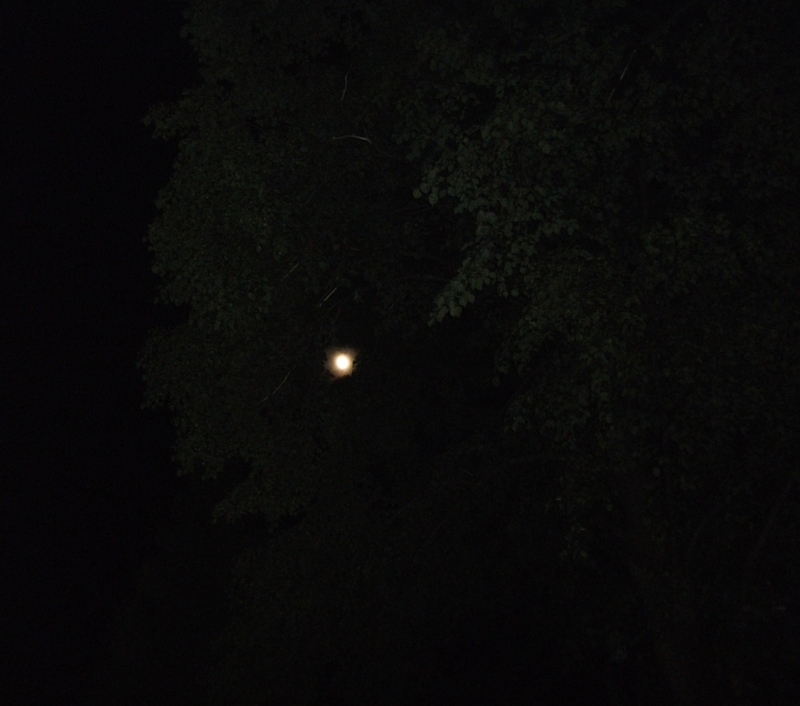 July 1, 2013 10:10 P.M. Finally, some nice weather. 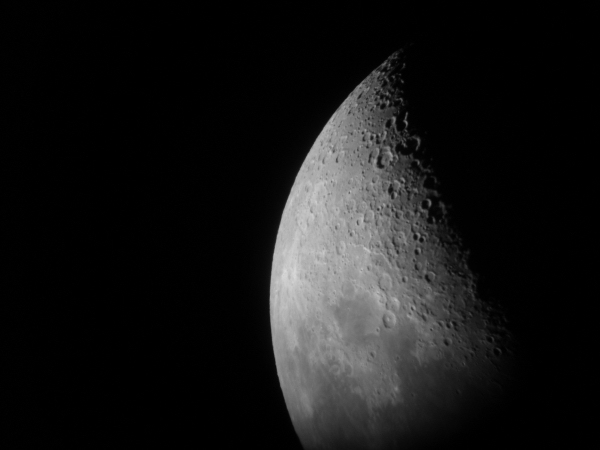 Took some shots of the moon early on, then spent the better part of the night just "looking around". 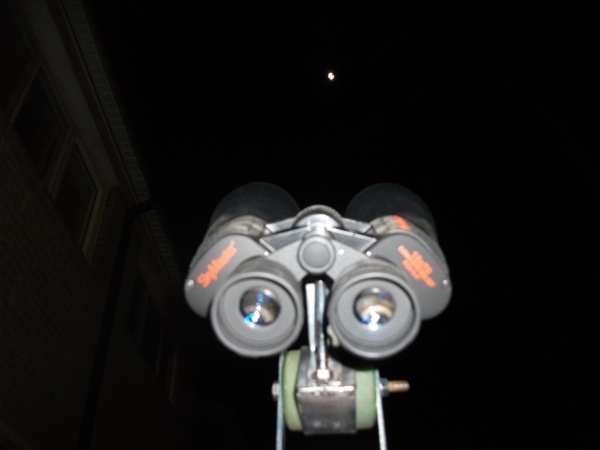 August 15, 2013 10:39 P.M.
What a clear night. 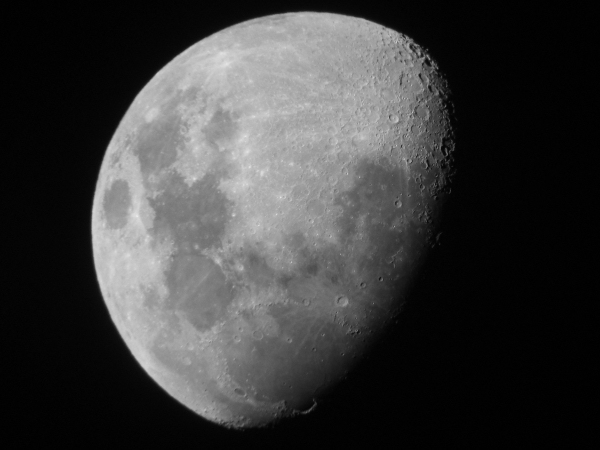 Got the moon at a perfect time; neat effect on the terminator line. I believe the crater edge is actually the Montes Alpes, though I could be wrong on that. I like these pictures, though. August 18, 2013 4:15 A.M.
Been out most of the night, and saw the Pleadies for the first time in a while. The picture doesn't do it justice; it even looks good through my little 8X23 bino's. Another nice night. Took a photo of my "stuff", wow. Pretty basic, but it's enough. 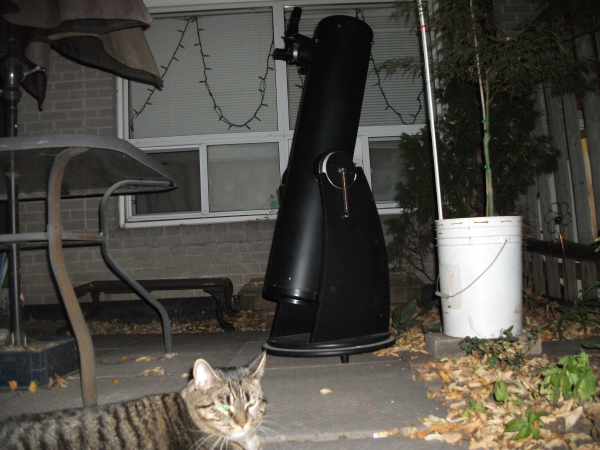 The cat likes to hang around when i'm out, this way she knows the racoons won't come around. She's also quite the mush, indoors and out. Good company! Another busy month. 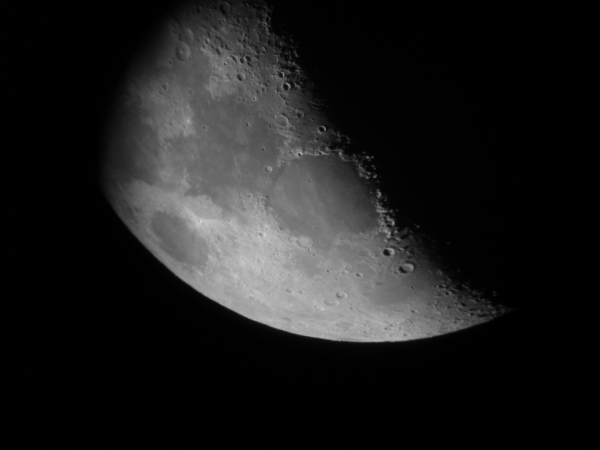 Was out twice with my telescope, but both times the seeing conditions were less than ideal. A conplete repeat of last month. What is with the weather...! Didn't go out once. Too busy and the weather is just crap. What a cold month so far. Had a storm that affected a good part of the country, and we lost power here for three days. We were lucky, as a lot of people had no power for weeks. 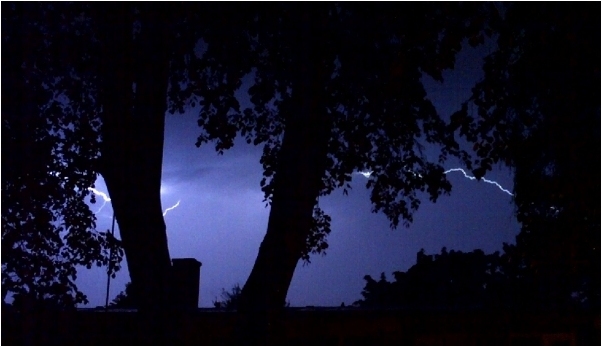 The first two shots are of the first night with no power. 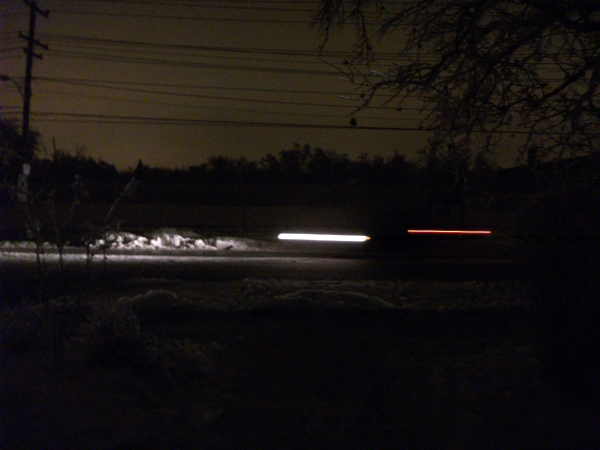 One is the view out the backyard, and the next is the street, with car lights frozen in time. The whole city of Toronto had no power, but of course the sky was completely overcast, due to the weather that caused the power failure in the first place! Arrghh!!! Can't win! 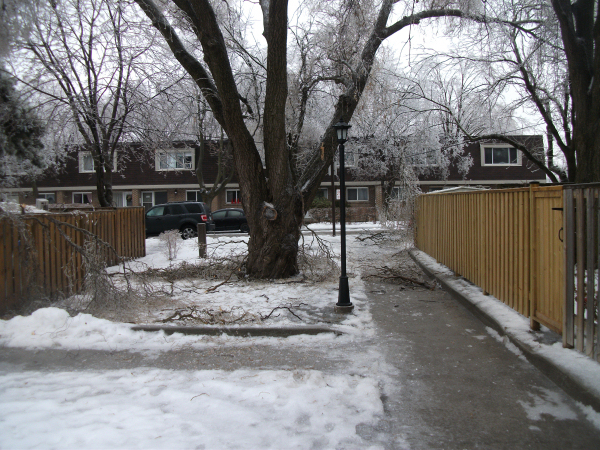 And this is what it looked like the next day. Lots of freezing rain. Oh, and by the way, Merry Christmas!! !